Stay:2017/11/6 mon. - 2017/11/20 sun. Founded in 2009 by Honoo Horikawa, the writer, director, choreographer and set designer, the company aims to bring out the “Arts that can make you chuckle”. Their works are characterized by their unique performance of “Hokorhythm” which decomposes the lines into single words, live music performance that can be appreciated through all the five senses with unusual sounds, and the costumes and scenography with a particular taste in their colors. 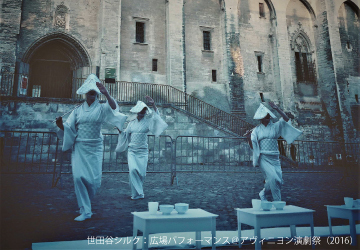 Recently, the company is actively performing outside Tokyo, participating in the Setouchi Triennale 2016 and giving an outside performance at Festival Off in Avignon. 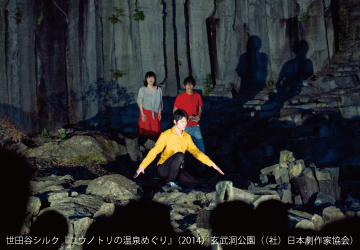 They have won Theatrical Art Prize at the 2nd Setagaya Arts Award “HISHO” in 2010 and Audience Prize and Encouraging Prize at Toga Directors Concours in 2013.